Developer Niantic has begun to unlock the full partner potential of the Pokémon GO augmented reality game. Just yesterday a partnership between the game and Sprint retail stores was announced, teasing new in-game locations corresponding to Sprint, Boost Mobile, and Radio Shack stores. 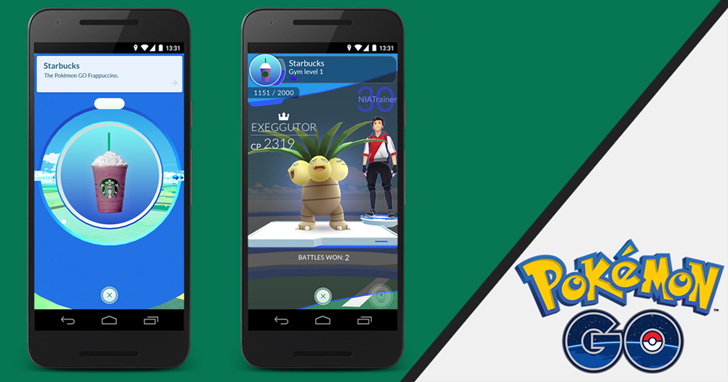 That rollout doesn't technically begin until December 12th, but the previously-leaked Starbucks promotion should be live right now, turning 7800 coffee shops in the US into new Pokestops and Pokémon Gyms. Leaked internal documents also said that participating Starbucks locations will offer an official Pokémon GO Frappuccino drink, which is happening, and that new Pokémon would be added to the game, which isn't, at least so far. The former is actually quite funny if you're a long-time fan of Nintendo's monster-catching game series: the raspberry- and blackberry-flavored drink is reminiscent of a "Slowpoke Tail," a rather cruel in-game foodstuff that's an important part of the plot in the Pokémon Gold and Silver Game Boy games. If you're upset that there aren't any new monsters to catch today, the official Pokémon GO Twitter account says they're coming on the 12th. Decompiled copies of the latest update also indicate that many new critters are incoming, with Generation 2 monster noise files found in the app along with mention of specific genders for creatures (used for monster breeding in the Nintendo games). With today's update, thousands of new Pokestops will allow players more convenient places to reload on Pokeballs and potions, and more gyms will mean more opportunities for asynchronous battles and coin collecting. SAN FRANCISCO – Dec. 8 - Niantic, Inc., The Pokémon Company International and Starbucks Coffee Company are teaming up to explore the intersection of technology and local community. Pokémon GO - one of the most popular mobile games of the year in which players can encounter Pokémon in the real world - has demonstrated how technology can motivate people to get outside and into their communities. Starbucks has a long-standing commitment to providing spaces for social interaction and real world community building in its extensive network of Starbucks locations. Today at 11 a.m. PST, more than 7,800 company-operated Starbucks locations in the U.S. will begin to transform within the game into PokéStops or Gyms, enabling Trainers to play the game while meeting friends, recharge in the Starbucks environment, and enjoy the new Pokémon GO Frappuccino® blended beverage. The Pokémon GO Frappuccino® blended beverage starts with a Vanilla Bean Frappuccino® and blends in raspberry syrup with freeze dried whole blackberries, topped with whipped cream - the perfect treat for any Pokémon Trainer on the go. To learn more about the Pokémon GO and Starbucks partnership, visit the official Pokémon GO blog at: PokemonGOlive.com, as well as Starbucks newsroom. Trainers can stay up to date on Pokémon GO announcements by following the official app on Twitter or liking on Facebook.